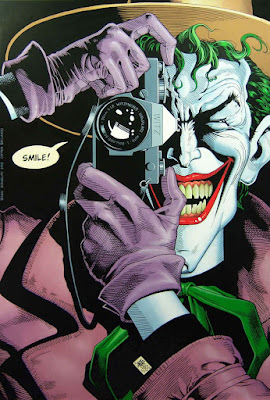 After the premiere of DC Entertainment's latest animated feature, Justice League: Gods and Monsters, producer Bruce Timm announced the next direct to video movie will be The Killing Joke. Based on the classic 1988 one-shot by Alan Moore and Brian Bolland, it tells the origin story of Batman's most infamous villain. Known as a seminal award-winning and best-selling graphic novel, the book has its detractors who say the treatment of Barbara Gordon was extremely violent and unnecessary. (Spoiler) The Joker's road to madness leads to kidnapping Commissioner Gordon, bounding and gagging him, forcing him to look at photographs of Barbara stripped, mutilated and ultimately paralyzed. How much of the original story will be kept intact is unknown as proven with Gods and Monsters, the themes are darker and more PG-13 in content in Timm's return to Warner Bros Animation. It will surely cause a lot of criticism leading up to the release in 2016. The Killing Joke, for most, remains an influential work that demonstrates the birth of insanity in one of pop culture's most well-known comic book villains. Batman: Bad Blood - An original Batman story that features the introduction of Batwoman to the new line of animated films. Justice League vs. Titans - Another original story and the first of the DC Universe Original Movies to feature the Teen Titans.